Sunrise Hitek is now extending reduced pricing on all iPad G5 cases in their üuber store https://www.sunrisehitek.com/product/ipad-slim-tough-case-g5. Price on single units reduced by 15%. Sunrise Hitek is extending reduced pricing on the popular G5 slim tough case for iPad in their üuber store https://www.sunrisehitek.com/product/ipad-slim-tough-case-g5. Price on single units has been reduced by 15%, save even more on bulk orders. This offer is available for all iPad models – 2, 3, 4, Air, Air 2, Mini, Mini 2, Mini 3. Pair it up with a wire keyboard for standardized Smarter Balanced or PARCC tests. All items are in stock for immediate shipping. 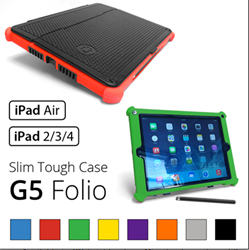 Their G5 Slim Tough Case https://www.sunrisehitek.com/product/ipad-slim-tough-case-g5 features an additional armor plate folio cover that completely eliminates broken screens. The G5 case is compatible with many charging carts, including the Bretford, Anthro, Datamation, Ergotron, and others once the folio cover is removed. Like previous generations, this case is available in (8) bright colors and mixed-color orders still receive bulk quantity discount. Optional full-color customization with logo artwork and tracking barcode is a great option for schools and sales representatives.